First I removed the rear access door and battery. I then had to unscrew the bracket holding the old hard drive in place. After that I could simply pull out the hard drive with my fingers and disconnect the SATA cable. Here’s why I needed the Torx screwdriver. I had to remove the 4 Torx screws around old hard drive and screw them into my SSD. 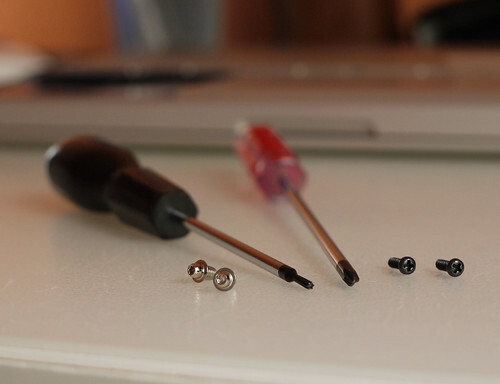 The screws serve as holders that fit in the orange brackets in the hard drive bay. I then assembled everything back together with the SSD. For the final (optional) step, I removed the rear panel to dust off the insides of my faithful MacBook. There was a lot of dust gathered in there from the past 2.5 years. Upgrade if you can afford it! I’ve only had the SSDs for a day but I already see some initial results. Boot times and launching apps are definitely faster. I can launch Safari and Mail in a single bounce from a cold boot! I didn’t do any real tests, but my old MacBook definitely feels zippier. If you afford to buy a brand new laptop, I think upgrading your drive to a SSD is definitely worth it. The only catch is that SSDs are more expensive compared to regular drives. I bought my SSD from OWC and had it shipped all the way from the US. The 240GB drive, an enclosure for my old drive and shipping cost me USD533.50, or about RM1650. I also had to throw in another RM166 for custom duties. And now with the money I’ve saved from not buying a new laptop, I have cash for some more fun stuff! 16 Comments on "Weekend Geek Project: Installing a SSD in my MacBook"
Glad i found your blog article on upgrading to a SSD. I’m also about to do the same thing, but first, is there an easy way(read also:”lazy”) to transfer all my data on my conventional harddisk to my brand new SSD without needing to reinstall everything from scratch? Hi Ivan, sorry I should have included that in the article! I used the free Carbon Copy Cloner software (http://www.bombich.com/) to clone my hard drive. Basically I put the new SSD into an enclosure and connected it to my Mac. It appears as a USB external drive. Then I used CCC to clone my existing hard drive to the SSD – took about 4 hours.. Once the cloning process was complete, I tested the backup by rebooting and holding the option key with the SSD still attached to the USB – this will allow you to boot from the SSD to ensure everything is fine. And finally I swapped the drives. Hope that helps! Hi, I noticed you mentioned custom duties… Which courier service did you choose from OWC for your SSD shipment…? USPS, DHL, or Fedex…? Hi Ethan, I used FedEx because it was discounted and was one of the faster options. Maybe not so worth it since it aded RM166 to the overall cost of the SDD..
Hmm… I’ve bought a lot of stuff from OWC, but not a single time was custom duties added… Perhaps your purchase exceeded RM 1k, that’s where custom duties came in…? That’s a very plausible reason. What stuff do you usually buy from them? Yes, join the SSD gang! Just look out for discounts on OWC. I bought my drive on the ‘MacWorld special pricing’ at USD480. It’s now 500+ I think. Definitely more pros than cons for using SSD. Prices should taper off in the near future making it more affordable overall. Also thanks to people like Apple who integrate into their products, it helps to bring the price down due to volume. Worth it if it’s a later generation MacBook/MBP like yours. Mine’s too old, so not going to attempt that. Hey Kian Cheong, well SupderDuper is free for the basic cloning. CCC is donationware. Either way both will clone your drive for free when swapping drives. But always support indie developers by buying! I think for RAM you can just buy from any brand right, no need to go all they way to OWC. I’ve got 2 sticks of Kingston RAM in my MacBook which I bought from LowYat that works just fine. Ohhh, I saw a Buy Now over their site, but I didn’t know much further about it. What model are those Kingston RAMs? Have you had any Kernel Panics with those? Hi Adil, I think SSDs are cheaper now. You can find Samsung SSDs in Low Yat, although I’m not sure what the price is. That being said, if you are buying a MacBook, I think it’s better not to void the warranty by replacing the drive yourself. 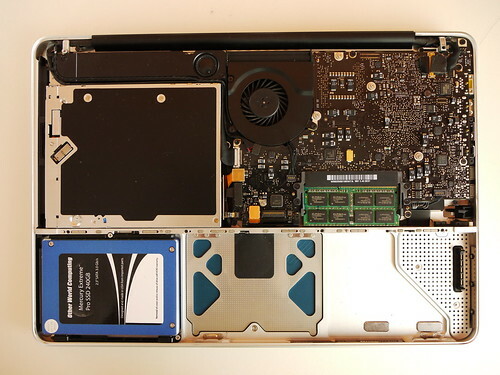 Just order online and customize your MacBook to upgrade the drive. This way it is included in the warranty too.